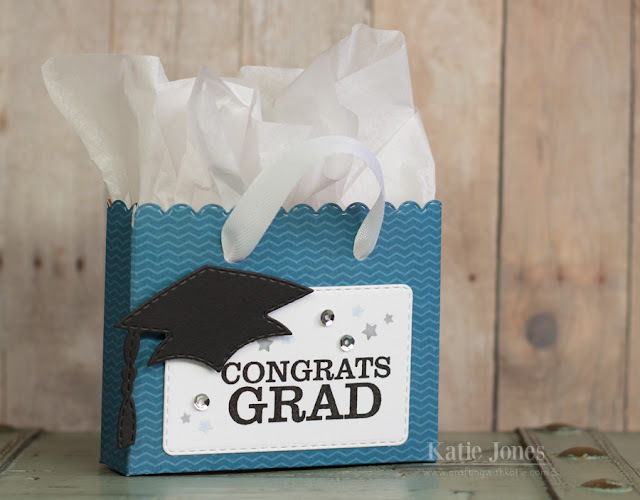 It's What a Treat Wednesday with My Creative Time, and today I've used my favorite gift bag die from Chalkboard Birthday to make a cute little treat bag to hold my niece's graduation gift! I decorated it with a white label made with a die from Love to Learn, stamping it with a sentiment from You're My Hero and some stars from Hello Baby. The graduation cap was made with a die from Here's Lookin' at You. I finished it off with a few sequins! Be sure to stop by Emma's blog for more inspiration from her and some other members of the design team! Oh Miss Katie Your Treat Bag is adorable...love the paper/cardstock you used and the way you decorated it. Your tag turned out Terrific....love all the creative ways you used Miss Emma's goodies. Congrats to your Niece and she is going to love her little bag and especially since YOU made it!! YOU ROCK!! The perfect graduation gift bag!!! Your niece will love your cute handmade bag...so cute the bag itself is a gift. If doing a memory album the bag front could be used. Super cute!!!! FAB grad treat!